I don’t know about you but I am a huge fan of a nice hot bath. Maybe it’s my three boys running around crazy all the time but taking twenty minutes of relaxation is HUGE for me! I also like to experiment with adding various concoctions to the bath and coming up with DIY pampering goodies (like my DIY citrus scrub.) 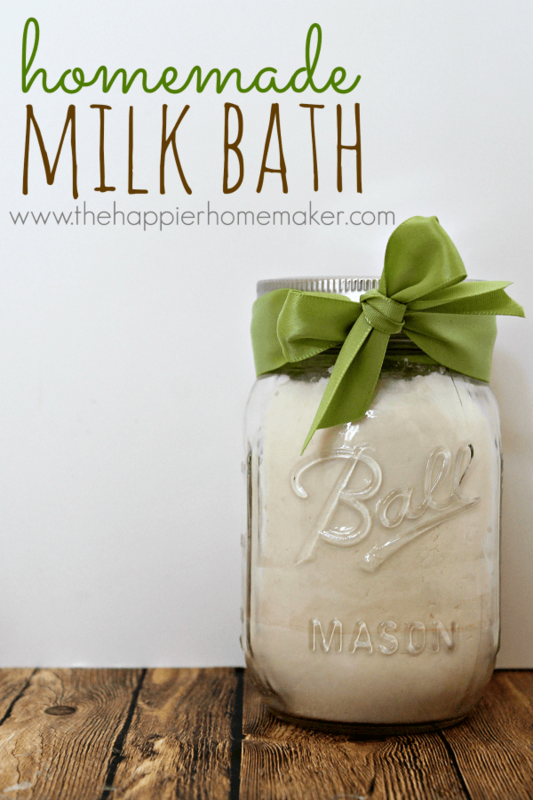 Today I am sharing a super pampering milk bath recipe!! 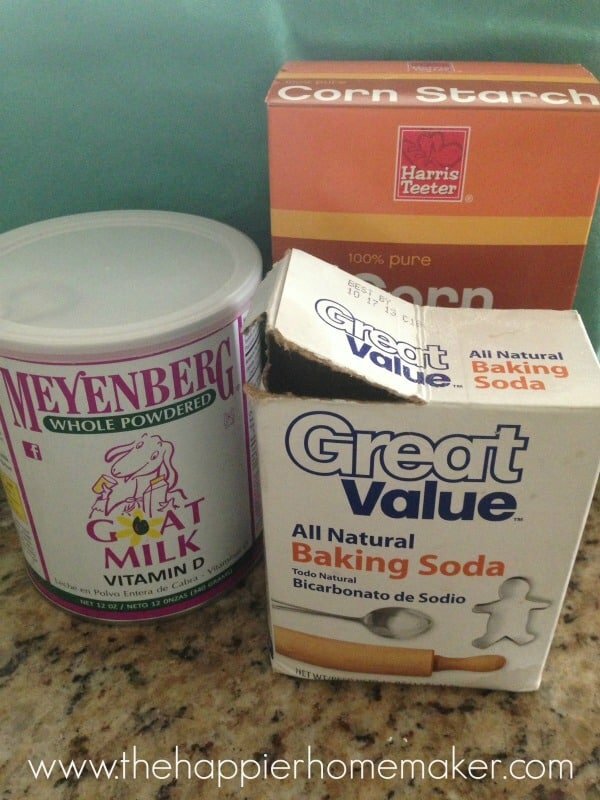 To make your milk bath combine the milk, baking soda, and cornstarch in a 2:1:1 ratio. 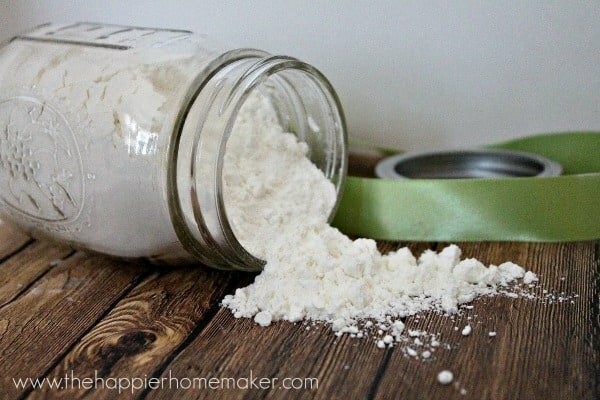 So if you used 1 cup of powdered milk you’d use 1/2 cup of baking soda and 1/2 cup of cornstarch. I make mine in mason jars so I eyeball it in the jar then close the jar and mix it up! If you’d like to add a scent add 5-10 drops of the essential oil of your choice (I use only Young Living Essential Oils) after mixing the powders and shake again. Lavender, Peppermint, or Citrus would be great options. To use simply pour a cup into the bath, I usually pour half of a small pint mason jar in so I get two baths from a jar. Wouldn’t this make a great gift too?? What should the consistency by like? It’s a soft powder when you put it all together Mari! I can’t wait to try this. Summer is coming to an end and I like to take a nice hot soak in the tub in the fall and winter time. I have some powdered buttermilk. Would that work in this? I think that would work as well Robin, I’ve never tried though so I’d love to hear back if you do! Do you have to use goats milk or coconut milk or can you something like NIDO whole powdered milk? It’s much cheaper and should still contain the fat you mentioned for moisturizing? I’m interested in making several jars of this to give as Christmas gifts. Do you know if this has an extended “shelf life,” or should I wait a few weeks to put this together? Thank you! I think this will be a really nice gift.